If there is a CD in the CDP DECK it plays the CD. 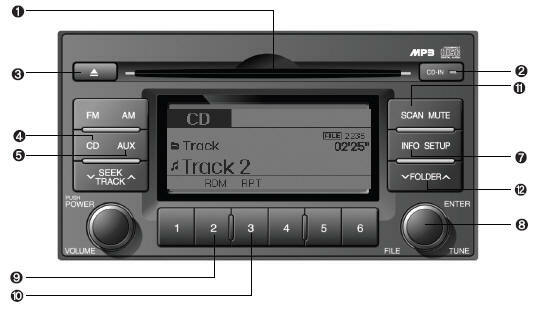 Press CD button to automatically insert CD when the disc is ejected from the deck by pressing CD EJECT. If the auxiliary device is connected, it turns to AUX MODE to play the sound from the auxiliary player. If no Disk and auxiliary device is connected, it displays “NO Media” 3 seconds and returns ti the previous mode. o Push [SEEK ] button for less than 0.8 second to play from the beginning of current song. o Push [SEEK ] button for less than 0.8 second and press again within 1 seconds to play the previous song. o Push [SEEK ] button for 0.8 or longer to initiate reverse direction high speed sound search of current song. o Push [SEEK ] button for less than 0.8 second to play the next song. o Push [SEEK ] button for 0.8 or longer to initiate high speed sound search of current song. Turn this button clockwise to display songs after current song. Also, turn this button counterclockwise to display songs before current song. To listen to the displayed song, press the button to skip to the song and play. o To assure Proper operation of the unit, keep the vehicle interior temperature within a nomal range by using the vehicle’s air conditioning or heating system. o This unit is made of precision parts. Do not attempt to disassemble or adjust any parts.